Nae a govrenment member; the Heich Representative is an internautional ceevilian owerseer o the Dayton peace greement wi authority tae dismiss electit an non-electit offeecials an enact legislation. 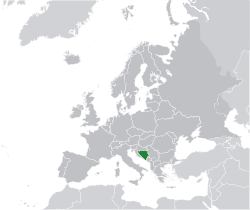 Bosnie an Herzegovinae (Serbian, Croatian, Bosnian: Bosna i Hercegovina or Босна и Херцеговина) kent as the Republic o Bosnie an Herzegovinae an aw, is a kintra in the Balkan region o Soothren Europe an haes aboot 4 million indwallers. It haes three main different kin o fowk, Bosniaks, Serbs an Croats. It wis ance pairt o the umwhile Yugoslavie. ↑ "Constitution of Bosnia and Herzegovina" (PDF). Retrieved 6 March 2015. ↑ 4.0 4.1 "Report for Selected Countries and Subjects". ↑ 5.0 5.1 "Bosnia and Herzegovina". International Monetary Fund. Retrieved 7 February 2018. ↑ "Distribution of family income – Gini index". The World Factbook. TWB. Retrieved 29 October 2017. ↑ "Human Development Report 2017". United Nations. 2017. Retrieved 29 October 2017. ↑ "Census of population, households and dwellings in Bosnia and Herzegovina, 2013: Final results" (PDF). Agency for Statistics of Bosnia and Herzegovina. June 2016. Retrieved 1 July 2016.